I think that Cam Jansen books are a good classroom library staple for grades 2 and 3. Its a good read aloud and a way to introduce the mystery genre to kids. 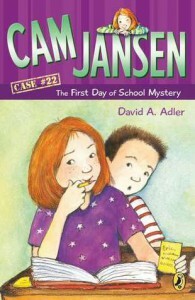 I saw that there is now a Young Cam Jansen series that are beginning readers for K and First grades. Kids will love Cam who has a photographic mind and solves mysteries and crimes all while going to school at the same time.